A blocking diode and bypass diode are commonly used in solar energy systems and solar panels. Learn how and why blocking diodes and bypass diodes are used. In simplest terms a diode can be understood as a two terminal electronic device, which allows electrical current to pass in one direction. Diodes are made of a semiconductor material, usually silicon, although materials like selenium and germanium are sometimes used in its construction. A diode only allows unidirectional flow of current. This is due to the fact that it offers low (ideally zero) resistance to current in one direction and at the same time, offers high (ideally infinite) resistance to the current in the opposite direction. This property of a diode is extensively used in the photovoltaic industry. Figure 1 shows the most common symbol for a diode found in a lot of circuit diagrams, however there could be variants. How are blocking diodes and bypass diodes used in solar installations? Diodes are extensively used in solar panel installations. Since the prevent backflow of current (unidirectional flow of current), they are used as blocking devices. They are also used as bypass devices to maintain the reliability of the entire solar power system in the event of a solar panel failure. Figure 2 shows the simple working of a blocking diode. Electricity flows from high potential to low potential. 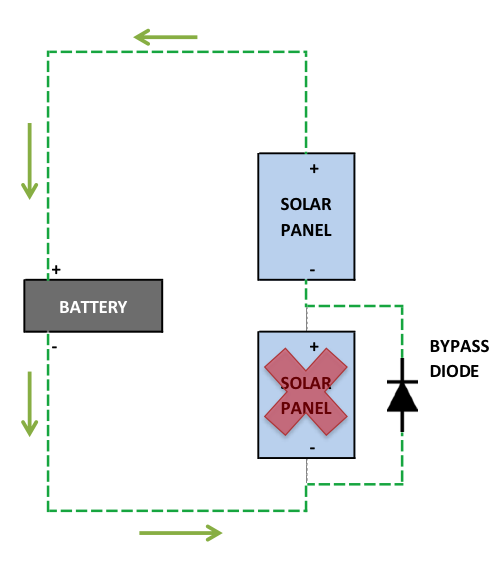 In this setup, during the day the solar panel (at high potential) produces electricity and charges the battery (at low potential). During night, when the panel is not producing any electricity (low potential), the battery is at a higher potential. 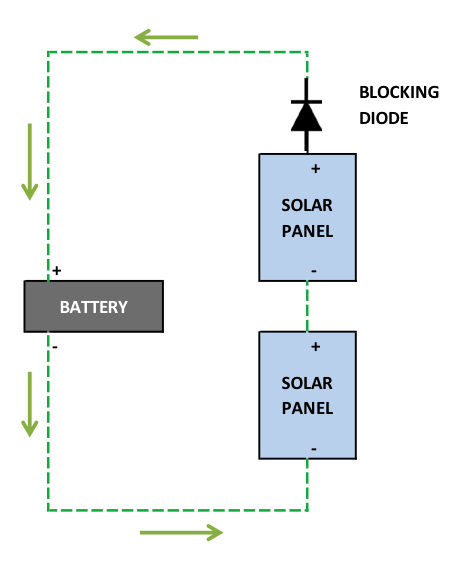 There is a possibility of the current flowing from the battery to the solar panel, thereby discharging the battery overnight. To prevent this from happening, a blocking diode is installed. It allows the current to flow from the panel to the battery but blocks the flow in opposite direction. It is always installed in series with the solar panel. Figure 3 shows the simple working of a bypass diode. In this setup, one of the solar panel is faulty and is not producing any current. The bypass diode in this case provides an alternate path for the current to flow and completes the circuit. It also prevents the current from other panels which are working (at high potential) to flow back to the faulty panel (at low potential). Thus even when a panel is faulty, the bypass diode still makes the whole solar system run and produce electricity at a lower rate. The bypass diodes should be installed in parallel to the panel. In a system with 2+ panels, wouldn’t it be better to use both a single blocking diode between the positive battery terminal and a bypass diode parallel with each solar panel? You wouldn’t want to put a bypass diode on _every_ solar panel, because that would create a short circuit between the battery terminals (or between the charger terminals, whatever your setup is). This being said, you would definitely want to have at least one blocker diode in addition to the bypass diodes (multiple blockers may be necessary for redundancy in high stress applications or in parallel circuits, but in general they would not be necessary).